I hope all of you have seen the video of a lightning strike in super slow motion that has been floating about the internet over the last week or so. It made it to the top of Digg and wound up in blogs of all types by the time I saw it last Friday. It really is a remarkable thing to see. It “strikes” me that, just like lightning, any new business venture must act in that way. What I mean by a new business venture is twofold. It can either be a startup or entrepreneurial company that is looking to break into the market, or a longstanding company that is in a new business development phase. Really, it can apply to anyone who is doing something new. In the video, the lightning bursts out in all directions, seemingly looking for something to grab onto. Once one of the “streams” touches the ground, the electric current is shot back through that one bolt. In a business sense, this is how any good company will act. You test the waters, not really knowing where or when an idea will catch on. And when it does, even if it is not the expected outcome, you have to latch on and run with it. Too many companies will target a product or service to one market and ignore potential users elsewhere. Sometimes, in fact, companies will even stop selling when unintended customers become the main customer base. Guy Kawasaki talks about this concept in the book, The Art of the Start. Flexibility lies at the heart of innovation. Being innovative requires you to adapt to changing conditions constantly. 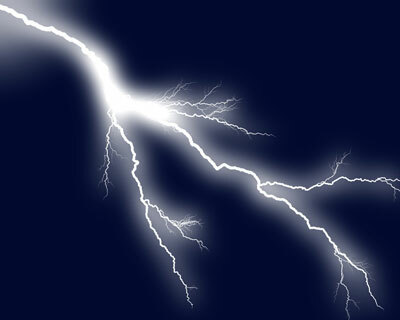 When launching an idea, a product, a service, or anything new, strike like the lightning bolt. Launch outwards in all directions and see what sticks. You may find a market that you never expected. And when you do, own it. This entry was posted on Tuesday, August 12th, 2008 at 4:03 am and is filed under Theory. You can follow any responses to this entry through the RSS 2.0 feed. You can leave a response, or trackback from your own site.